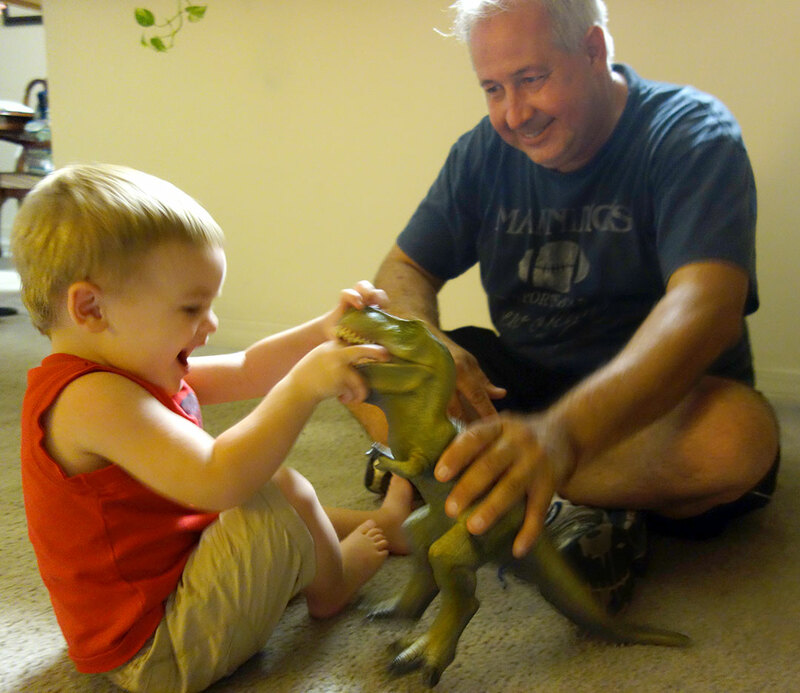 Uncle Chris gave Henry a big T. Rex as a gift. Dinosaur attacks were reported in the area soon after. Henry shares his toy car with his Great-grandma Virgie. Playing with Grandma Lois and John Mark. Aunt Cheryl and Henry simultaneously make calls. Chocolate milk at Morning Call. Jacqui enjoys a bite of beignet. Getting a push from Paw Paw. Paw Paw and Henry climb the equipment. Hydrating for the 90-degree temperatures. Story time with Uncle Chris and Paw Paw Butch. 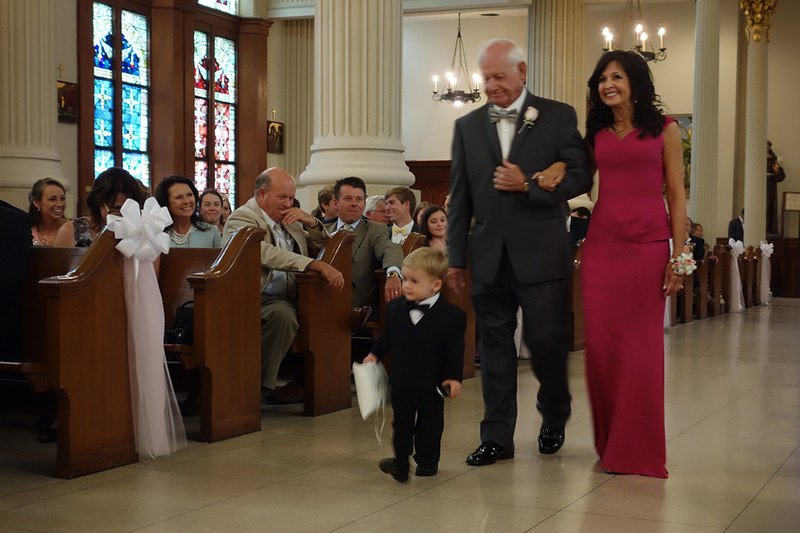 Henry’s big moment as ring bearer required a last minute line-up change since he and his Paw Paw have become practically inseparable during this trip. Nevertheless, he pulled it off and kept his composure during the ceremony. Congrats and thanks to both Tyler and Michelle! Group shot with Uncle Chris and Grandma Lois. Holding hands with Paw Paw. Visiting Uncle Chris at home. Beignets at Morning Call in City Park. Uncle Chris shows Henry a praying mantis. Uncle Chris and Henry at a playground in City Park. Jacqui, Mark, Henry and Grandma Lois take a ride on a streetcar. Dad and Henry on streetcar. Riding the St. Charles streetcar line. Waiting for Mosca’s Chicken a la Grande. Paw Paw Butch and Henry make a selection on the jukebox at Mosca’s. Aunt Cheryl and Henry enjoy the jukebox at Mosca’s. Reclining in Paw Paw’s seat. Henry selects a single malt scotch. Saints line up on offense vs. Falcons. clockwise from top: Jeff Landry (old friend from Chalmette), Chris, Mark, Jacqui. Jacqui’s first Saints game is a nail-biting 23-17 victory over Atlanta. Jacqui and Mark at the Mercedes-Benz Superdome. Henry had yet another birthday celebration today when he helped his Paw Paw Butch celebrate his 75th and they both received gifts. Henry also marked the occasion by taking a few tentative baby steps to his Aunt Cheryl. The first year of Henry’s life has gone by in the blink of an eye. Again, running the risk of sounding cliché, it is a happy event, but also filled with pangs of nostalgia. I realize it’s early in his life to feel nostalgia and I’m happy to watch him flourish, but can’t help but feel some bit of sadness for how fast it has gone. I am sure this is a common parental feeling that I never fully understood until becoming one myself. It is amazing to watch him change each day, but there is also a yearning to hold on to each moment for much longer than it seems to last. To celebrate Henry’s actual birthday today, we went to the Aquarium of the Americas in New Orleans with Grandma Lois, Uncle Chris and his girlfriend, Janette. After swimming with fishes and jumping the shark, we celebrated at Aunt Cheryl’s with cake and ice cream afterwards. 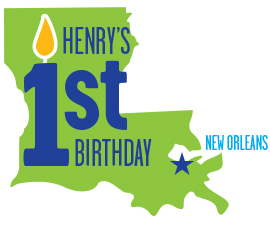 Henry wore a pin on his shirt the whole day that read, “My First Birthday” to let everyone know. Watching stingrays at the Aquarium of the Americas. Mom shows Henry more fish. Uncle Chris points out a stingray to Henry. Sitting on Grandma Lois’ lap. Jacqui, Henry and Grandma Lois at the Aquarium. Henry tries to steal a (fake) penguin egg. Paw Paw Butch and Grandma Lois.